Gain complete, dynamic control over traffic flows in your network security appliance. ntop’s powerful n2disk and nProbe Cento applications realize unparalleled performance acceleration from Accolade’s hardware Flow offload/shunting capabilities allowing ntop to deliver mission critical network monitoring application performance to our customers. Accolade, the technology leader in FPGA-based host CPU offload today introduced a breakthrough “Flow Shunting” feature preserving critical CPU cycles to enable unprecedented application performance and significant cost savings. Flow Shunting reduces the number of packets an application must process to provide complete, dynamic control over traffic flows forwarded from the FPGA to the application. CPU bound network monitoring and cyber security applications such as Suricata, Wireshark and others will now be able to take advantage of this capability in hardware, optimizing packet processing in order to scale such software applications at 10, 40 and 100GE. Accolade’s Flow Shunting feature is a subset of its powerful Flow Classification feature set. 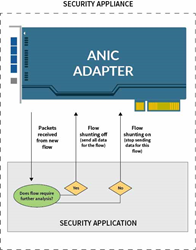 Packet header and metadata information in addition to a bi-directional flow context is maintained for each Flow entry in an onboard Look-up Table in each ANIC adapter/NIC. This allows each ANIC adapter to take specific action on any individual flow to forward, drop or re-direct a given flow. Control over each of these actions now squarely resides with the application that controls the ANIC adapter. Eliminate processing (or storage) of unwanted traffic flows. Cost savings from reduced disk space / CPU utilization requirements. Offload host CPUs from processing unnecessary traffic. Scale network security software applications such as Suricata, Wireshark and ntop. “ntop’s powerful n2disk and nProbe Cento applications realize unparalleled performance acceleration from Accolade’s hardware Flow offload/shunting capabilities allowing ntop to deliver mission critical network monitoring application performance to our customers,” said Luca Deri, Founder of ntop. Accolade is the technology leader in FPGA-based Host CPU Offload PCIe NICs/Platforms. Accolade’s line of 1-100GE products enable 100% packet capture, flow classification, flow shunting, packet filtering, deduplication and more. Our customers are global leaders in developing network monitoring & cybersecurity applications as well as in the network test and measurement, telecom and video stream monitoring markets.